Reading, MA - Reading Cooperative Bank (RCB) is proud to be sponsoring Reading Public Schools' first annual Parent University. 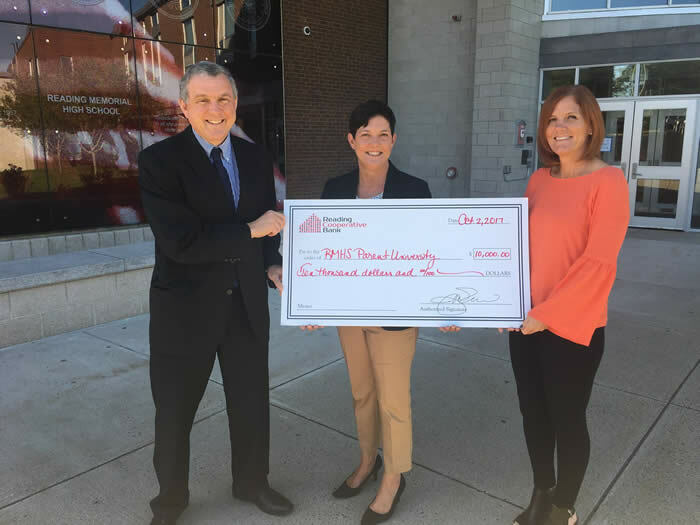 Recently, RCB President & CEO Julie Thurlow presented a $10,000 grant to John Doherty, Superintendent of Schools, and Sandy Calandrella, Director of Extended Day & Community Education, to help fund the project. The event is being held on Saturday, October 21st, from 8:00 A.M-12:15 P.M., at Reading Memorial High School (RMHS) in the Performing Arts Center. The purpose of Parent University is to provide timely information to parents on a variety of topics that affect them and their children. Attendees will benefit from free workshops presented by community experts on a variety of topics. The University will begin with a presentation by Dr. David Walsh and Erin Walsh entitled “Connection unleashes Children’s Potential”. Following the keynote, there will be several workshop sessions that parents can attend including topics on mindfulness, the college process, student mental health, and raising kids in the digital age. At the event, free childcare for children in grades K-5 will be provided by the Extended Day Program. Children will be participating in activities run by 1v1 Sports. Pre-registration for childcare must take place when registering for Parent University workshops. To sign up for the event, please visit: www.reading.k12.ma.us/community/adult-and-community-education/. Any additional questions can be directed to Sandy Calandrella at Sandy.Calandrella@reading.k12.ma.us.